2013 Indy 500 winner Tony Kanaan led the Big Machine Records racing team to victory in the Dan Wheldon Memorial Pro Am Karting Challenge at New Castle Motorsports Park on Saturday. 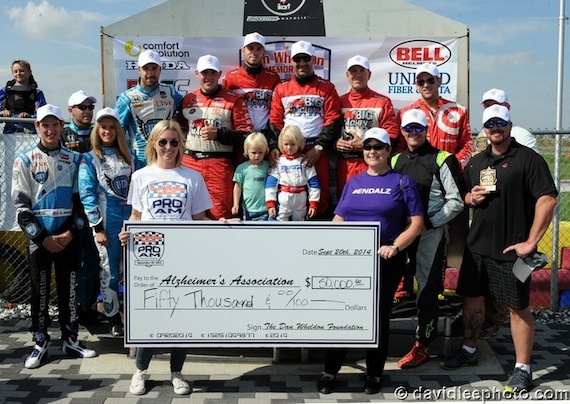 This is Big Machine’s second consecutive year to win the race which benefits the Dan Wheldon Foundation, named for the late driver who was a good friend of BMLG President/CEO Scott Borchetta. The event raised $100,000 for the foundation, which will in turn contribute $50,000 to the Alzheimer’s Association. BMLG is also supporting Alzheimer’s awareness through involvement with the documentary Glen Campbell… I’ll Be Me, which was executive produced by Borchetta. The soundtrack will be released Sept. 30 on Big Machine Records and the film will follow on Oct. 24. Creative Nation will present a benefit for local organization Preston Taylor Ministries with performances by Creative Nation songwriters Luke Laird, Barry Dean, Natalie Hemby and Maggie Chapman, as well as special guests. 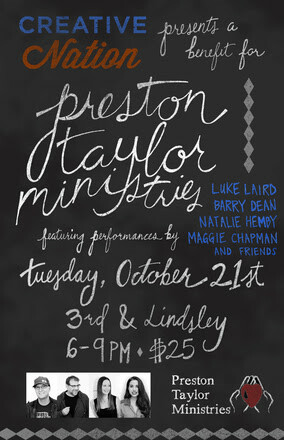 The event is Tuesday, Oct. 21, 6:00 p.m. at 3rd & Lindsley with all proceeds going directly to PTM. Tickets are $25 and can be purchased here. Kix Brooks and GAC’s Suzanne Alexander will be celebrity bartenders to benefit St. Jude Children’s Research Hospital on Tuesday, Sept. 30, 6:00 – 8:00 p.m. at Tin Roof 2 in Franklin, Tenn. Alexander says, “This is going to be a fun evening and you don’t have to drink alcohol to support this event. I can make a mean O.J., cranberry and seltzer drink.” She has been raising funds for the charity this year by running half-marathons in different cities leading up to the New York City Marathon on Nov. 2. Follow her here. Musicians Corner, the growing Nashville non-profit that hosts free concerts in Centennial Park every spring and fall, is hosting an online auction at Charitybuzz starting Oct. 7. Stars who have signed guitars for the auction include The Avett Brothers, Kenny Chesney, Brad Paisley, Dolly Parton, Stevie Wonder, Jackson Browne, and Lady Antebellum. There is also one guitar autographed by Justin Beiber, Keith Urban, Sheryl Crow,The Civil Wars, Jason Aldean and blue collar comedian Ron White. Proceeds benefit Musicians Corner, running every Saturday afternoon between now and Oct. 25.